This article is about the Dalai Lama lineage. For the current Dalai Lama, see 14th Dalai Lama. The Dalai Lama is a Buddhist leader of religious officials of the Gelug or "Yellow Hat" branch of Tibetan Buddhism. The name is a combination of the Mongolian word dalai meaning "Ocean" and the Tibetan word བླ་མ ་bla-ma (with a silent "b") meaning "chief" or "high priest." "Lama" is a general term referring to Tibetan Buddhist teachers. In religious terms, the Dalai Lama is believed by his devotees to be the rebirth of a long line of tulkus who are considered to be manifestations of the bodhisattva of compassion, Avalokiteśvara. Traditionally, the Dalai Lama is thought of as the latest reincarnation of a series of spiritual leaders who have chosen to be reborn in order to enlighten others. The Dalai Lama is often thought to be the director of the Gelug School, but this position belongs officially to the Ganden Tripa, which is a temporary position appointed by the Dalai Lama who, in practice, exerts much influence. For certain periods of time between the 17th century and 1959, the Dalai Lamas sometimes directed the Tibetan government, which administered portions of Tibet from Lhasa. The 14th Dalai Lama remained the head of state for the Central Tibetan Administration ("Tibetan government in exile") until his retirement on March 14, 2011. He has indicated that the institution of the Dalai Lama may be abolished in the future, and also that the next Dalai Lama may be found outside Tibet and may be female. In 1578 the Mongol ruler Altan Khan bestowed the title Dalai Lama on Sonam Gyatso. The title was later applied retrospectively to the two predecessors in his reincarnation line, Gendun Drup and Gendun Gyatso. 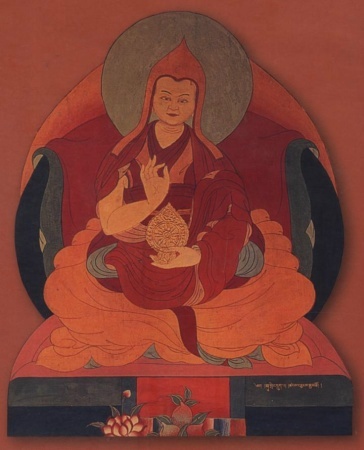 Gendun Gyatso was also Sonam Gyatso's predecessor as abbot of Drepung monastery. However, the 14th Dalai Lama asserts that Altan Khan did not intend to bestow a title as such and that he intended only to translate the name "Sonam Gyatso" into Mongolian.
. . . many writers have mistranslated Dalai Lama as "Ocean of Wisdom." The full Mongolian title, "the wonderful Vajradhara, good splendid meritorious ocean," given by Altan Khan, is primarily a translation of the Tibetan words Sonam Gyatso (sonam is "merit"). The very name of each Dalai Lama from the Second Dalai Lama onwards had the word Gyatso [in it], which means "ocean" in Tibetan. Even now I am Tenzin Gyatso, so the first name is changing but the second part [the word "ocean"] became like part of each Dalai Lama's name. All of the Dalai Lamas, since the Second, have this name. So I don't really agree that the Mongols actually conferred a title. It was just a translation. Whatever the intention may have been originally, the Mongolian "Dalai," which does not have any meaning as a Tibetan term, came to be understood commonly as a title. The name or title Dalai Lama in Mongolian may also have derived originally from the title taken by Temüjin or Genghis Khan when he was proclaimed emperor of a united Mongolia during 1206. Temüjin took the name Čingis Qāghan or "oceanic sovereign," the Anglicized version of which is Genghis Khan. Tibetans address the Dalai Lama as Gyalwa Rinpoche ('Precious Victor'), Kundun ('Presence'), Yishin Norbu ('Wish fulfilling Gem') and so on. 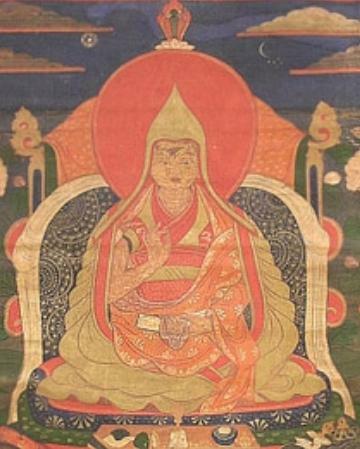 Sonam Gyatso was an Abbot at the Drepung Monastery who was considered widely as one of the most eminent lamas of his time. Although Sonam Gyatso became the first lama to have the title "Dalai Lama" as described above, since he was the third member of his lineage, he became known as the "Third Dalai Lama." The previous two titles were conferred posthumously upon his earlier incarnations. 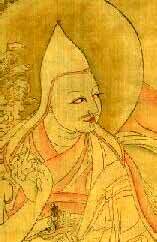 Yonten Gyatso (1589–1616), the 4th Dalai Lama, and a non-Tibetan, was the grandson of Altan Khan. "The institution of the Dalai Lama has become, over the centuries, a central focus of Tibetan cultural identity; "a symbolic embodiment of the Tibetan national character." Today, the Dalai Lama and the office of the Dalai Lama have become focal points in their struggle towards independence and, more urgently, cultural survival. The Dalai Lama is regarded as the principal incarnation of Chenrezig (referred to as Avalokiteshvara in India), the bodhisattva of compassion and patron deity of Tibet. In that role the Dalai Lama has chosen to use peace and compassion in his treatment of his own people and his oppressors. In this sense the Dalai Lama is the embodiment of an ideal of Tibetan values and a cornerstone of Tibetan identity and culture." "The Dalai Lamas have also functioned as the principal spiritual guide to many Himalayan kingdoms bordering Tibet, as well as western China, Mongolia and Ladakh. The literary works of the Dalai Lamas have, over the centuries, inspired more than fifty million people in these regions. Those writings, reflecting the fusion of Buddhist philosophy embodied in Tibetan Buddhism, have become one of the world's great repositories of spiritual thought." 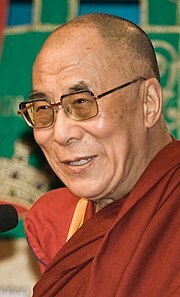 The current Dalai Lama is often called "His Holiness" (HH) by Westerners (by analogy with the Pope), although this does not translate to a Tibetan title. Before the 20th century, European sources often referred to the Dalai Lama as the "Grand Lama." For example, in 1785 Benjamin Franklin Bache mocked George Washington by terming him the "Grand Lama of this Country." Some in the West believed the Dalai Lama to be worshipped by the Tibetans as the godhead. During 1252, Kublai Khan granted an audience to Drogön Chögyal Phagpa and Karma Pakshi, the 2nd Karmapa. Karma Pakshi, however, sought the patronage of Möngke Khan. Before his death in 1283, Karma Pakshi wrote a will to protect the established interests of his sect by advising his disciples to locate a boy to inherit the black hat. His instruction was based on the premise that Buddhist ideology is eternal, and that Buddha would send emanations to complete the missions he had initiated. Karma Pakshi's disciples acted in accordance with the will and located the reincarnated boy of their master. The event was the beginning of the teacher reincarnation system for the Black-Hat Line of Tibetan Buddhism. During the Ming Dynasty, Emperor Yongle bestowed the title Great Treasure Prince of Dharma, the first of the three Princes of Dharma, upon the Black-Hat Karmapa. Various sects of Tibetan Buddhism responded to the teacher reincarnation system by creating similar lineages. In the 1630s, Tibet became entangled in power struggles between the rising Manchu and various Mongol and Oirat factions. Ligden Khan of the Chakhar, retreating from the Manchu, set out to Tibet to destroy the Yellow Hat sect. He died on the way in Koko Nur in 1634. His vassal Tsogt Taij continued the fight, even having his own son Arslan killed after Arslan changed sides. Tsogt Taij was defeated and killed by Güshi Khan of the Khoshud in 1637, who would in turn become the overlord of Tibet, and act as a "Protector of the Yellow Church." Güshi helped the Fifth Dalai Lama to establish himself as the highest spiritual and political authority in Tibet and destroyed any potential rivals. The time of the Fifth Dalai Lama was, however, also a period of rich cultural development. The Fifth Dalai Lama's death was kept secret for fifteen years by the regent (Tibetan: desi, Wylie: sde-srid), Sanggye Gyatso. This was apparently done so that the Potala Palace could be finished, and to prevent Tibet's neighbours taking advantage of an interregnum in the succession of the Dalai Lamas. Tsangyang Gyatso, the Sixth Dalai Lama, was not enthroned until 1697. Tsangyang Gyatso enjoyed a lifestyle that included drinking, the company of women, and writing love songs. In 1705, Lobzang Khan of the Khoshud used the sixth Dalai Lama's escapades as excuse to take control of Tibet. The regent was murdered, and the Dalai Lama sent to Beijing. He died on the way, near Koko Nur, ostensibly from illness. Lobzang Khan appointed a new Dalai Lama who, however was not accepted by the Gelugpa school. Kelzang Gyatso was discovered near Koko Nur and became a rival candidate. The Dzungars invaded Tibet in 1717, and deposed and killed Lobzang Khan's pretender to the position of Dalai Lama. This was widely approved. However, they soon began to loot the holy places of Lhasa, which brought a swift response from Emperor Kangxi in 1718; but his military expedition was annihilated by the Dzungars, not far from Lhasa. "After him [Jamphel Gyatso the VIIIth Dalai Lama (1758–1804)], the IXth and Xth Dalai Lamas died before attaining their majority: one of them is credibly stated to have been murdered and strong suspicion attaches to the other. The XIth and XIIth were each enthroned but died soon after being invested with power. For 113 years, therefore, supreme authority in Tibet was in the hands of a Lama Regent, except for about two years when a lay noble held office and for short periods of nominal rule by the XIth and XIIth Dalai Lamas. It has sometimes been suggested that this state of affairs was brought about by the Ambans—the Imperial Residents in Tibet—because it would be easier to control the Tibet through a Regent than when a Dalai Lama, with his absolute power, was at the head of the government. That is not true. The regular ebb and flow of events followed its set course. The Imperial Residents in Tibet, after the first flush of zeal in 1750, grew less and less interested and efficient. Tibet was, to them, exile from the urbanity and culture of Peking; and so far from dominating the Regents, the Ambans allowed themselves to be dominated. It was the ambition and greed for power of Tibetans that led to five successive Dalai Lamas being subjected to continuous tutelage." "It is perhaps more than a coincidence that between the seventh and the thirteenth holders of that office, only one reached his majority. The eighth, Gyampal Gyatso, died when he was in his thirties, Lungtog Gyatso when he was eleven, Tsultrim Gyatso at eighteen, Khadrup Gyatso when he was eighteen also, and Krinla Gyatso at about the same age. The circumstances are such that it is very likely that some, if not all, were poisoned, either by loyal Tibetans for being Chinese-appointed impostors, or by the Chinese for not being properly manageable." Thubten Gyatso, the 13th Dalai Lama, assumed ruling power from the monasteries, which previously had great influence on the Regent, during 1895. Due to his two periods of exile in 1904–1909, to escape the British invasion of 1904, and from 1910–1912 to escape a Chinese invasion, he became well aware of the complexities of international politics and was the first Dalai Lama to become aware of the importance of foreign relations. After his return from exile in India and Sikkim during January 1913, he assumed control of foreign relations and dealt directly with the Maharaja and the British Political officer in Sikkim and the king of Nepal rather than letting the Kashag or parliament do it. Thubten Gyatso issued a Declaration of Independence for his kingdom in Central Tibet from China during the summer of 1912 and standardised a Tibetan flag, though no other sovereign state recognized the independence. He expelled the Ambans and all Chinese civilians in the country, and instituted many measures to modernise Tibet. These included provisions to curb excessive demands on peasants for provisions by the monasteries and tax evasion by the nobles, setting up an independent police force, the abolishment of the death penalty, extension of secular education, and the provision of electricity throughout the city of Lhasa in the 1920s. Thubten Gyatso died in 1933. The 14th Dalai Lama, was not formally enthroned until 17 November 1950, during the People's Republic of China invasion of the kingdom. Fearing for his life in the wake of a revolt in Tibet in 1959, the 14th Dalai Lama fled to India where he has led a government in exile since. In 2001, he ceded his absolute power over the government to an elected parliament of selected Tibetan exiles. He has advocated for full independence for Tibet, though a popular referendum in the 1990s demanded he seek autonomy instead. He is still seeking great autonomy from China, although he has threatened to go back to advocating independence if this strategy does not work. Starting with the 5th Dalai Lama and until the 14th Dalai Lama's flight into exile during 1959, the Dalai Lamas spent the winter at the Potala Palace and the summer at the Norbulingka palace and park. Both are in Lhasa and approximately 3 km apart. Following the failed 1959 Tibetan uprising, the 14th Dalai Lama sought refuge in India. The then Indian Prime Minister, Jawaharlal Nehru, allowed in the Dalai Lama and his coterie of Tibetan government officials. The Dalai Lama has since lived in exile in Dharamsala, in the state of Himachal Pradesh in northern India, where the Central Tibetan Administration is also established. Tibetan refugees have constructed and opened many schools and Buddhist temples in Dharamsala. By the Himalayan tradition, phowa (Tibetan) is the discipline that transfers the mindstream to the intended body. Upon the death of the Dalai Lama and consultation with the Nechung Oracle, a search for the Lama's reincarnation, or yangsi (yang srid), is conducted. Traditionally it has been the responsibility of the High Lamas of the Gelugpa Tradition and the Tibetan government to find his reincarnation. The process can take around two or three years to identify the Dalai Lama, and for the 14th, Tenzin Gyatso it was four years before he was found. The search for the Dalai Lama has usually been limited historically to Tibet, although the third tulku was born in Mongolia. Tenzin Gyatso, though, has stated that he will not be reborn in the People's Republic of China. In his autobiography, Freedom In Exile, he states that if Tibet is not free, he will reincarnate elsewhere." The particular form of Palden Lhamo at Lhamo La-tso is Gyelmo Maksorma, "The Victorious One who Turns Back Enemies." The lake is sometimes referred to as "Pelden Lhamo Kalideva," which indicates that Palden Lhamo is an emanation of the goddess Kali, the shakti of the Hindu God Śhiva. It was here that during 1935, the Regent, Reting Rinpoche, received a clear vision of three Tibetan letters and of a monastery with a jade-green and gold roof, and a house with turquoise roof tiles, which led to the discovery of Tenzin Gyatso, the present 14th Dalai Lama. Once the High Lamas have found the home and the boy they believe to be the reincarnation, the boy undergoes a series of tests to affirm the rebirth. They present a number of artefacts, only some of which belonged to the previous Dalai Lama, and if the boy chooses the items which belonged to the previous Dalai Lama, this is seen as a sign, in conjunction with all of the other indications, that the boy is the reincarnation. There has also been one nonrecognised Dalai Lama, Ngawang Yeshey Gyatso, declared 28 June 1707, when he was 25 years old, by Lha-bzang Khan as the "true" 6th Dalai Lama – however, he was never accepted as such by the majority of the population. "In the mid-1970s Tenzin Gyatso, The Fourteenth Dalai Lama, told a Polish newspaper that he thought he would be the last Dalai Lama. In a later interview published in the English language press he stated "The Dalai Lama office was an institution created to benefit others. It is possible that it will soon have outlived its usefulness." These statements caused a furor amongst Tibetans in India. Many could not believe that such an option could even be considered. It was further felt that it was not the Dalai Lama's decision to reincarnate. Rather, they felt that since the Dalai Lama is a national institution it was up to the people of Tibet to decide whether or not (sic) the Dalai Lama should reincarnate." During September 2007 the Chinese government said all high monks must be approved by the government, which would include the selection of the 15th Dalai Lama after the death of Tenzin Gyatso. Since by tradition, the Panchen Lama must approve the reincarnation of the Dalai Lama, that is another possible method of control. The Dalai Lama said as early as 1969 that it was for the Tibetans to decide whether the institution of the Dalai Lama "should continue or not." He has given reference to a possible vote occurring in the future for all Tibetan Buddhists to decide whether they wish to recognize his rebirth. In response to the possibility that the PRC may attempt to choose his successor, the Dalai Lama has said he will not be reborn in a country controlled by the People's Republic of China or any other country which is not free. The Dalai Lama was on the cover of Time magazine on April 20, 1959, with the headline "The Escape that Rocked the Reds." After the 14th Dalai Lama (Tenzin Gyatso) received the Nobel Peace Prize in 1989, the public awareness of the Dalai Lama became even more prevalent, and the Dalai Lama became the subject of several motion pictures, including Seven Years in Tibet starring Brad Pitt, Martin Scorsese's feature film Kundun, as well as documentary films, including the 2008 theatrically released Dalai Lama Renaissance, narrated by Harrison Ford. ^ Online Etymology Dictionary. Etymonline.com. Retrieved on 2011-04-10. ^ Laird (2006), p. 142. ^ Laird (2006), p. 143. ^ Roux, Jean-Paul. (2003). Genghis Khan and the Mongol Empire, p. 25. Trans from the French by Toula Balas. Thames & Hudson. London. ISBN 0-500-30113-1. ^ Sheel (1989), p. 23. ^ Verhaegen (2002), pp. 5–6. ^ Pennsylvania Aurora. August 1795. ^ Nicolas Jovet. L'histoire des religions de tous les royaumes du monde. 1710. pp. 553–555. ^ Richardson (1984), pp. 48–9. ^ a b Stein (1972), p. 85. ^ Richardson (1984), pp. 59–60. ^ Norbu and Turnbull (1968), p. 311. ^ Sheel (1989), pp. 24, 29. ^ Sheel (1989), p. 20. ^ Norbu and Turnbull (1968), pp. 317–318. ^ Tibet in Exile, CTA Official website, retrieved 2010-12-15. ^ Burke, Denis (2008-11-27). "Tibetans stick to the 'middle way'". Asia Times. http://www.atimes.com/atimes/China/JK27Ad01.html. Retrieved 2010-08-07. ^ Saxena, Shobhan (2009-10-31). "The burden of being Dalai Lama". The Times of India. http://timesofindia.indiatimes.com/india/The-burden-of-being-Dalai-Lama/articleshow/5183939.cms. Retrieved 2010-08-06. ""If the middle path fails in the short term, we will be forced to opt for complete independence or selfdetermination as per the UN charter""
^ a b c d "The Dalai Lama". BBC. Last updated 2006-09-21. http://www.bbc.co.uk/religion/religions/buddhism/people/dalailama_1.shtml. Retrieved 2008-05-17. ^ Laird (2006), pp. 139, 264–265. ^ Dowman (1988), p. 260. ^ Laird (2006), p. 139. ^ Norbu and Turnbull (1968), pp. 228–230. Reprint: p. 311. ^ "Dalai Lama's confirmation of reincarnation". Tibet Travel info. http://www.tibettravel.info/tibetan-buddhism/confirmation-of-reincarnation.html. Retrieved 2008-05-17. ^ a b The title "Dalai Lama" was conferred posthumously to the 1st and 2nd Dalai Lamas. ^ Glenn H. Mullin, "Faces of the Dalai Lama: Reflections on the Man and the Tradition," Quest, vol.6, no.3, Autumn 1993, p.80. ^ Verhaegen (2002), p. 5. ^ Interview with Tashi Wangdi, David Shankbone, Wikinews, November 14, 2007. ^ "Dalai's reincarnation will not be found under Chinese control". Government of Tibet in Exile. http://www.tibet.com/DL/next-reincarnation.html. ^ Dalai Lama may forgo death before reincarnation, Jeremy Page, The Australian, November 29, 2007. ^ "Dalai's reincarnation will not be found under Chinese control". Government of Tibet in Exile ex Indian Express July 6, 1999. http://www.tibet.com/DL/next-reincarnation.html. ^ "The Escape that Rocked the Reds". TIME. http://www.time.com/time/covers/0,16641,19590420,00.html. Retrieved 2010-12-06. Dowman, Keith. (1988). The Power-Places of Central Tibet: The Pilgrim's Guide. Routledge & Kegan Paul Ltd., London. ISBN 0-7102-1370-0 (pbk). Laird, Thomas (2006). The Story of Tibet: Conversations with the Dalai Lama. Grove Press, New York. ISBN 978-0-8021-827-1. Murray Silver, "When Elvis Meets the Dalai Lama," (Bonaventure Books, Savannah, 2005). Norbu, Thubten Jigme and Turnbull, Colin M. (1968). Tibet: An account of the history, the religion and the people of Tibet. Reprint: Touchstone Books. New York. ISBN 0-671-20559-5. Schulemann, Guenther: Geschichte der Dalai-Lamas, Harrassowitz, Leipzig, 1958. Sheel, R. N. Rahul. "The Institution of the Dalai Lama." The Tibet Journal, Vol. XIV No. 3. Autumn 1989. Stein, R. A. (1972). Tibetan Civilization. Stanford University Press. ISBN 0-8047-0806-1 (cloth); ISBN 0-8047-0901-7 (paper). Verhaegen, Ardy (2002). The Dalai Lamas: The Institution and Its History. Emerging Perceptions in Buddhist Studies, no. 15. New Delhi, India: D. K. Printworld (P) Ltd. ISBN 81-246-0202-6. Dalai Lama. (1991) Freedom in Exile: The Autobiography of the Dalai Lama. San Fransisco, CA. This page uses content from the English language Wikipedia. The original content was at Dalai Lama. The list of authors can be seen in the page history. As with this Familypedia wiki, the content of Wikipedia is available under the Creative Commons License.